On Friday March 20th 2015 a Total Solar Eclipse will be visible from Earth over a narrow corridor of a few 100 km wide. This narrow corridor will be mostly covering the North Atlantic, making landfall on the Faroe Islands and Svalbard. A solar eclipse occurs when the Moon passes between Earth and the Sun, thereby casting a shadow on the surface of the Earth. The Moon's shadow actually consists of two parts – the umbra and the penumbra. The penumbra is the fainter outer shadow and the umbra is the darker inner narrow shadow. Any location inside the penumbra will experience a partial eclipsed Sun and any location inside the umbra will experience a totally eclipsed Sun. Fig. 2. Geometry of a solar eclipse. The motion of the Moon around the Earth and the Earth-Moon system around the Sun, and their respective sizes, is such that eclipses of the Moon and the Sun can be observed from Earth whenever the Moon or Earth blocks sunlight from the other. When the Earth blocks the sunlight from the Moon, a total lunar eclipse is observed, which covers the whole Moon. However, when a total solar eclipse occurs, the angular size of the Moon is such that the eclipsed Sun can be observed over a narrow path sweeping across the surface of the Earth. 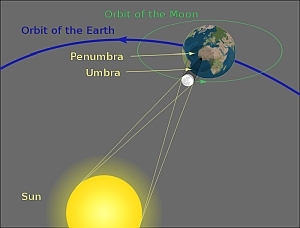 Because both the Earth and the Moon move around in an elliptical orbit, and the distance of the Moon to the Sun varies, the size of both the umbra and penumbra will vary as well and sometimes the Moon is just not big enough to cover the whole disc of the Sun resulting in an Annular Solar eclipse. In principle, a solar eclipse can occur several times a year. However, the inclination of the Moon's orbit around the Earth and the Earth around the Sun is such that total solar eclipses happen once every year or year and a half. The mean frequency for a total eclipse of the Sun at any given location on the Earth's surface is once in 375 years! The last Total Solar Eclipse to occur in Norway was in 1954 and the next one won't be until 2061 (again over Svalbard) or 2126 if you only count mainland Norway. The Total Solar Eclipse on Friday 20th March 2015 will start in the western Atlantic, 650 km west of Canada's Labrador coast and 450 km south of the southern tip of Greenland. It will then race across the Atlantic ocean touching land at only two places: the Faroe Islands between Scotland and Iceland, and the Svalbard Archipelago (particularly, Spitsbergen Island). In Longyearbyen, Svalbard, the first contact, that is the start of the partial eclipse, will start at 09:11:53UT. Fig. 3. Animation of the lunar shadows movement across the Earth. About 59 minutes later, at 10:10:43UT second contact will take place, marking the start of totality. This is when the solar corona will become visible in all its glory. 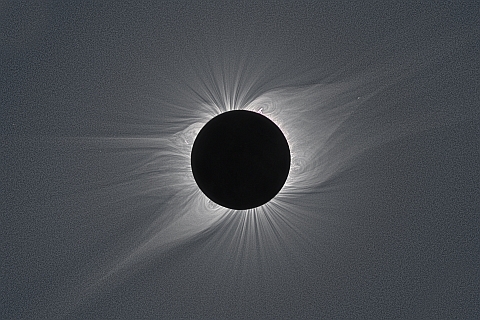 After a mere 2 minutes and 27 seconds, third contact will occur at 10:13:10UT, which marks the end of totality and the disappearance of the corona. This will be followed by a partial phase of about another 59 minutes before fourth contact and the end of the solar eclipse at 11:12:21UT. It is never safe to look at a partial or annular eclipse, or the partial phases of a total solar eclipse, with the naked eye without proper solar filters or projection techniques. Even when 99% of the Sun's surface (the photosphere) is obscured during the partial phases of a solar eclipse, the remaining crescent Sun is still intense enough to cause a retinal burn. Failure to use proper observing methods may result in permanent eye damage or severe visual loss. The only time that the Sun can be viewed safely without filtering is during totality, when the Moon completely covers the disk of the Sun. Not only is it safe to view the Sun at that time, but it is essential to be able to view the totality in all its glory. The preparations for the eclipse / campaign is divided into 6 parts using the old Auroral Station in Adventdalen, The Kjell Henriksen Observatory, UNIS in Longyearbyen and the Dornier at Lufttransport AS. Table 1 lists the PI's and their main objectives. Table 1. The total eclipse team at UNIS. The UNIS course AGF-216: The Stormy Sun and Northern Lights, will be offered to students and local people from Longyearbyen. High resolution ground-based spectral measurements will be carried out by a team from the Institute for Astronomy at the University of Hawaii. They will use the old station in Adventalen. Cameras will be operative at KHO to see if we are lucky to detect aurora during the passage of the eclipse. Furthermore, an airborne experiment is planned to image the event with a hyperspectral camera. Media contact for scientific experiments: Fred Sigernes. Text by Arne Danielsen, 2014. Edited by Shadia Habbal, 2015.